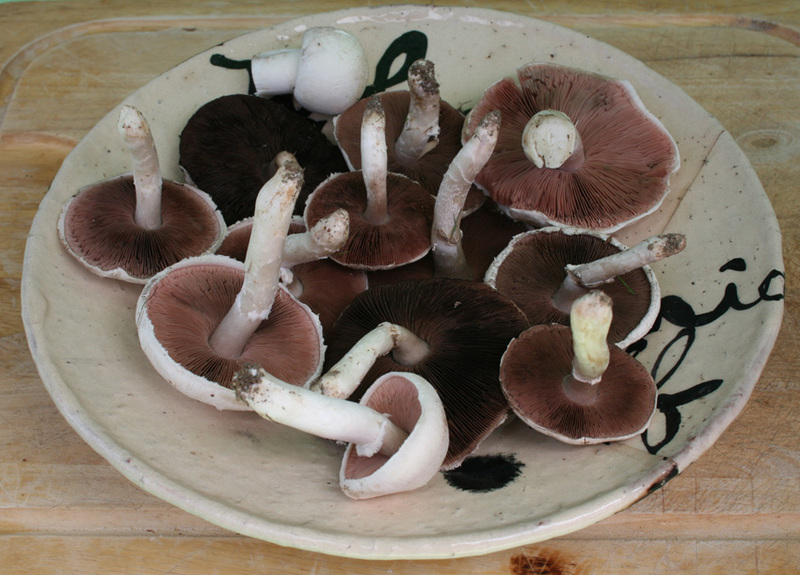 Three torrential storms in three weeks + warm nights and hot days = free mushrooms for dinner! Dad popped over today to spray some thistles and came across a surprise crop of seasonally-confused fungi in one of of the back paddocks. We ended up picking half a bucket of baby buttons and meaty field mushrooms (though I have to confess to hopping over the fence to pinch a few from the neighbour’s hill paddock too). I guess it makes up for all the flooding last weekend, when our pump shed ended up half-submerged in the raging torrent. I’ll bake them tonight with new season’s garlic, breadcrumbs, thyme, parmesan and lashings of cream. Homemade wild blackberry and apple pie with (more) lashings of cream. 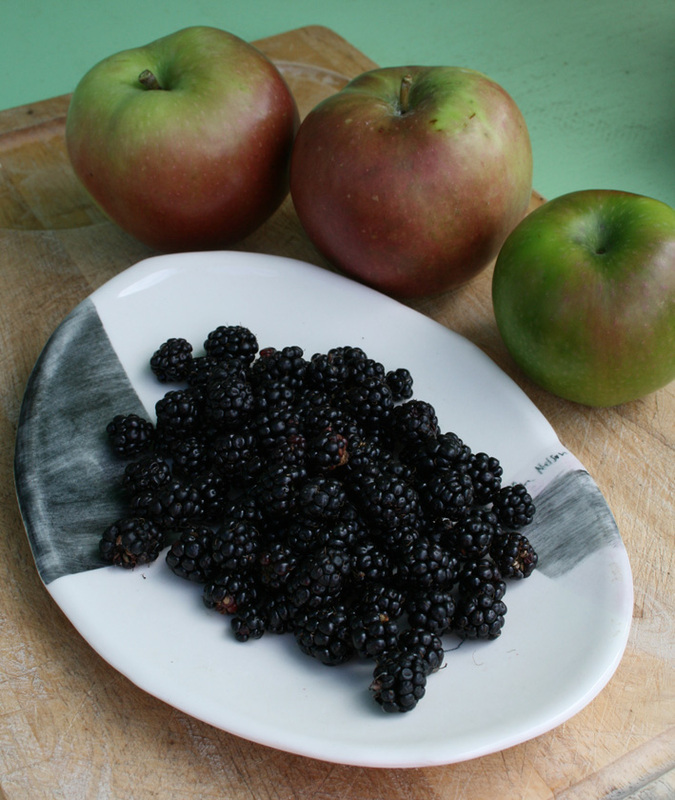 On the way back from ‘shrooming, I grabbed a basket of apples from our orchard and foraged for a small bowl of dark, delicious blackberries from the side of one of the cattle races. I could probably have picked half a bucket of blackberries too, except the only thing I had to collect them in was Dad’s sun hat… and he was worried about ending up with a sunburnt noggin so I had to cut my foraging short. Hi Lynda – your blog is such fun to read. Being a rather hopeless romantic I love hearing about your wedding prep..from all the clever planning and planting of your garden to the gourmet burgers, tres chic lemonade stand, delicious dahlias and baby bump etc… I thought you might have a deal with a magazine and everything would be top secret! A spread in NZ Gardener perhaps? You sound very happy indeed.. Thank you – it’s fun to write. The garden is almost there now, though I’ve had to step back and just concede that some parts of it won’t be perfect. Like the weeds in the beds down the bank… and the unplanted beds we’ve only just finished building. I’m kinda glad we launched into sprucing up the garden with such a gung-ho attitude for the wedding, as I suspect I’ll be good for nout for a few months after the baby arrives. Just because you are supposedly eating for two, it doesn’t mean you can go mad with the cream. LOL! You’ll regret it later when those kg’s won’t move. haha Take it from one who knows. Love your blog. BTW Is it too late to plant any spuds or should I put something else in the ground and wait for next year. What is the crop that one puts in, to make the ground better. Thanks alot Lynda, love hearing your escapades! Depending on where you live, you can definitely get another crop of spuds in. They take 90-100 days to mature. Unless you live somewhere that gets early frosts, you’ll be fine. i have picked 12 2ltr containers from the farm ,they seem to be very large [blackberries] this year. Ours are tiny, but super tasty so I can’t complain. I’d rather have yours though! 24 litres… I’m very jealous. Are you making jam, bottling or just freezing them? apples plums black boy peaches pears nashis, my wife said that the claves i was eying up did not come into the urban foraging catergory.. This is probably a really dumb question…but how do you know when your apple/pears etc are ready for picking? Apples are generally ripe when either (a) the birds start pecking holes in them or (b) they start falling off when it’s windy. But if you give the stalks a gentle twist and the fruit comes off without yanking, it’s ripe. Pears are trickier to judge as they can’t be left to fully ripen on the tree. If you leave them too long, the birds will steal them or they will rot from the inside out. With green pears, the skins change from dull green to slightly yellowish when they’re almost ripe. Pick a few and pop them in your fruit bowl for a couple of days; if they ripen satisfactorily then start picking like mad! Can’t wait to hear how your wedding day eventuates – I just hope you will have a warm sunny February day. If not though, I doubt whether it will make any difference to such a special day. Usually the West Coast is behind the rest of NZ, but would you believe that we feasted on field mushrooms at the beginning of December. If it rains, we can cope. But if it’s windy, we’re in trouble, as our place is right on top of a hill. I’ve eaten a few doughnuts too… our local bakery next to work makes the BEST cream doughnuts in Auckland, for just $2. Such a bargain, I can’t resist.